By the time we reached this mileage wall in Franklin Grove Illinois, we had clocked up almost 1000 miles. Today did not get off to a great start as the folks in the room next to ours decided to party until after midnight last night. Down at breakfast, the cook had failed to show up for work and so there was no hot food. As we left the hotel I saw a rather unhappy fellow in chef’s attire having a cigarette outside the kitchen. Eventually we were on our way, rejoining R30 near Valparaiso and getting back on main street America. James found some country music and classic rock on the radio so he was happy and we were back alongside the railway for much of the day. 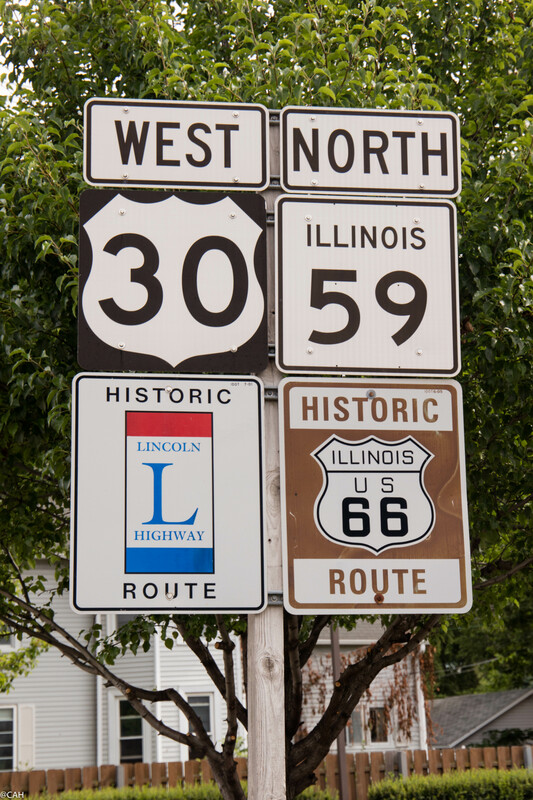 Joliet and Plainfield Illinois are familiar places from Route 66 which we drove in 2013. There is a brief section where the two roads coincide. 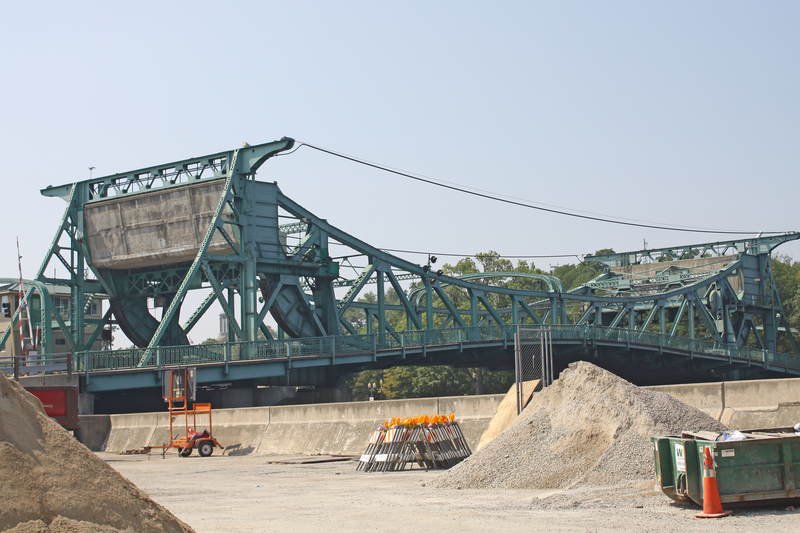 We crossed the bridge over the Des Plaines River in the opposite direction to the last time and this is the photograph I took then. After Plainfield the road switches to R31 in Aurora and then R28 in Geneva. As road travel increased in the early 1920s, a shortage of hotels developed so camping sites were set up along the highway and Aurora has one of the shelters that were built and which have been restored. We were soon back in the cornfields with a few Trump posters and the odd Bernie one. Some extremely long freight trains passed us in several places or were parked up. 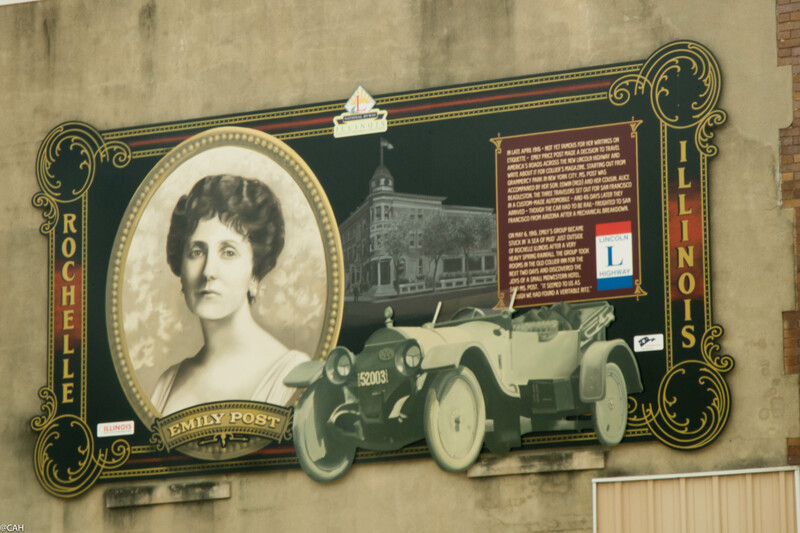 Many of the small towns we passed through have murals and other historical sites. 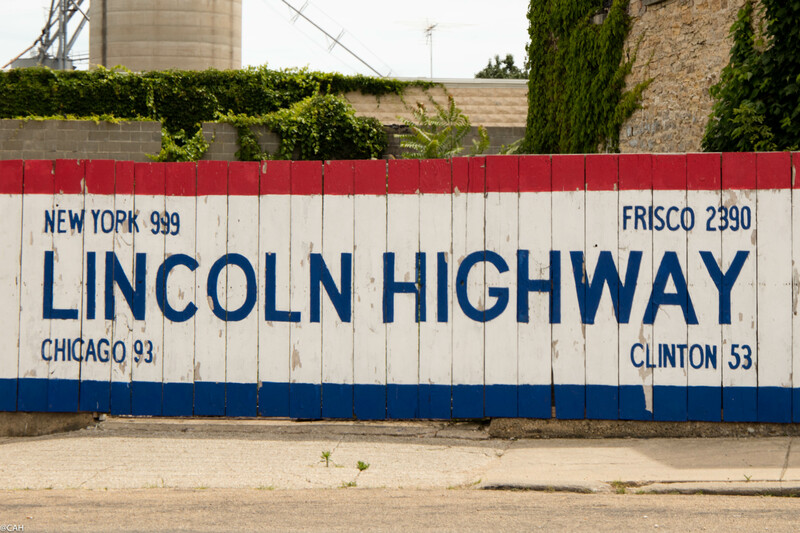 The Lincoln Highway Association’s HQ is in Franklin Grove and has a gift shop. The woman inside thought we were southerners at first. As I signed the visitors’ book I noticed that there had been none for a couple of days and she was very keen to fill us in on all the history she could. We eventually escaped and had our lunch in a park at Dixon which was holding various sporting events and a petunia show. Saturday seems to be the day when everyone mows the grass alongside the road. In other places, wildflowers are left to grow alongside fields and roads. In the UK some of the nature organisations are trying to persuade landowners and councils to delay mowing grass verges until wildflowers have set seed so that they are not wiped out. We crossed the Mississippi River at Clinton and entered Iowa back on Route 30 alongside factories spewing pungent fumes into the atmosphere. The last time I was in Iowa was around 20 years ago attending the biennial international conference of a small scientific society I belonged to. Our president at the time was based at the University of Iowa and the conference was held there. At immigration at Chicago O’Hare, I was asked why I was visiting the USA and when I told the officer the reason he replied ‘I ain’t never heard of a conference in Iowa City’. 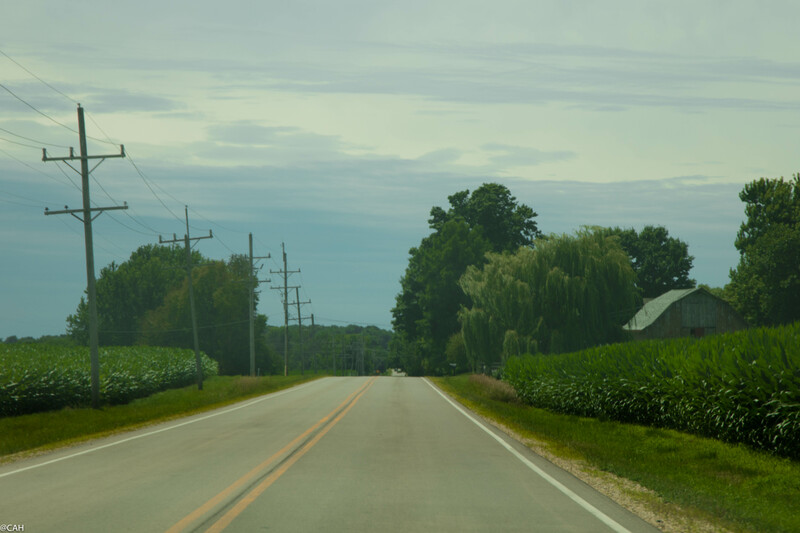 Soon we were back in flat farmland until nearer to Cedar Rapids where small hills appeared. After crossing the Cedar River, we found our roadside hotel for the night.